Apple is running a new iPhone 7 Plus commercial called “Take Mine”, the advertisement emphasizes the devices Portrait Mode camera feature. 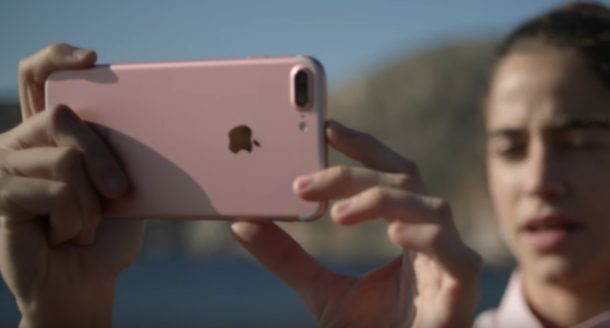 In the commercial, a girl is visiting a coastal Mediterranean town, and after taking a picture with Portrait mode on her iPhone she soon becomes the impromptu town photographer, snapping portrait mode pictures of many people. It’s a fun lighthearted commercial that does a pretty good job of showing off the Portrait Mode ability on iPhone 7 Plus. Portrait mode uses the optical zoom lens on iPhone Plus to get in closer to the subject, and then uses software to create a depth-of-field effect which blurs the backgrounds to better emphasize the foreground subject. It’s a great feature that works quite well, though if you have complex subjects or wild hair, you may notice some unusual effects. I like Portrait mode but it does not work as well as advertised (kind of like Siri). The iPhone Portrait feature works reasonably well if the subject has a hat on or has a very simple short haircut. If they have curly hair, long hair that is not flush against their profile, or complex hair, it blurs out there hair and makes it look very weird like they got a bad digital haircut. It also struggles with objects like a leaf, flower, etc. Things people commonly take macro photos of. Thanks for sharing! That’s not something they mentioned in the rollout of iPhone 7. The song in the iPhone Portrait commercial is a Greek song with yodeling and a ukulele sung by a Hawaiian group? Wow that’s an eclectic mix. What are the lyrics being yodeled? Yodeling is usually Swiss. Maybe the name of the artist was meant tongue-in-cheek, and Bezos never even dreamed anyone outside of Greece would hear of him (I’m assuming Bezos was an individual). Similarly, maybe the yodeling was thrown in for comedic effect. A lot of people with Greek origins actually wondered what’s with that music. Thanks for the discussion. This commercial’s music was driving me crazy because, as a musicologist, I didn’t recognize the style at all. As it turns out, Kostas Bezos, the musician, was Greek and leader of a group called White Birds. They specialized in Xabagies, a 1930s fusion of traditional Greek music influenced by Hawaiian music. Xabagies is a subcategory of Rebetika, a style of street music in Athens. (It’s discussed in a 1997 article by Risto Pekka Pennanen in the British Journal of Ethnomusicology.) BTW, yodel-style singing is found in not only in Alpine regions, but U.S. cowboy songs and Central Africa, among others. Kind of funny how differently people think. I lived in the Mediterranean so I was enamored with the commercial. The first thing I thought about the song was “What a lighthearted silly song, goes well with the ambiance of silliness of the people being photographed”. I knew the song was Swiss but I felt it went well with the theme that the commercial was bringing out. It’s a mishmash of Swiss, Hawaiian, and Greek. Kind of like a message to me that we’re all the same, all connected. As a photographer I guarantee you that the photos shown in the ad have NOTHING TO DO with the iPhone7, probably they were taken by a professional using SPECIALIZED PHOTO GEAR that includes: Reflectors or Soft Boxes, Wide aperture professional lenses, pro or semi-pro DSLR cameras, and of course the use of several photography techniques for taking portraits. I have used iPhone and it has a great camera. That doesn’t mean it can take the photos advertised. I’m sure reflectors and soft boxes were used, but the rest of your claim needs an answer from Apple – I hope you are wrong! OK, the scenes and people are Greek. The song is also sung in Greek. The title of the song as mentioned is “Pame sti Honolulu,” which translates as, “We’re Going to Honolulu.” So, you got ukuleles, yodeling, Greek lyrics all backing action at a Greek village. Opa! Yeah, I also thought, what’s the yodeling about in Greece? Doesn’t make sense. Maybe intentional to distract you from the fact that the phone doesn’t do anything spectacular. It makes no sense for Greeks to yodel. It’s confusing people about the location – unless they speak Greek. Producer should have picked some fun & fast bouzouki music! Panielo (Hawaiian cowboys) sing many songs falsetto and with yodelling. Something sung in Greek doesn’t make it Greek, especially when the title is “We’re Going to Honolulu.” I agree with Anastasios, Sotiris, what?, Amy & Chris. And the paniolos of the Hawaiian upcountry are island natives of Portuguese ancestry– pretty far, culturally, from the Greek Islands. Per the Mademoiselle Montana yodel heaven web site (https://mademoisellemontana.wordpress.com/2008/09/07/do-they-yodel-in-greece-or-is-it-hawaii-kostas-bezoss-hawaiian-orchestra/), “Kostas Bezos (1905-1943) was born in a village near Corinth in Greece and was a guitarist who not only played rebetika songs, the typical Greek style of the era, but also steel guitar in Hawaiian style. He recorded songs between the 1930’s and the 1940’s for Columbia and His Master’s Voice. The rebetika songs were released under the pseudonym of A. Kostis or K. Kostis. Apparently he recorded more Hawaiian songs but it is easier to find his Greek songs on cd. Maybe some record collectors have 78rpm recordings. So it seems that everyone is correct! Did the people making the ad diligently search for the most obscure Greek musician in recording history, find the song, which has nothing to do with Greece, so they could poke fun? Yodeling has NOTHING to do with Greece. They should pull the ad and re-do the music. The music stinks, and is an insult to Greeks. I beg to differ. That wonderful, joyful song is the only thing I like about that commercial. Thank goodness someone has uploaded it at YouTube. I’m glad to see that our family was not alone in trying to decipher this commercial. What is the point of going to the Mediterranean to shoot a commercial emphasizing the beautiful landscapes and warm friendly people but making it exclusive of the recognizable traditional music. Just saying…. This couldn’t of been any better. Great scenery and music. By the way, even though the music isn’t typical Greek doesnt mean its ungreek. The music is meant to be uplifting and joyful. It’s was also typical in the 1930’s in Greece to incorporate some kind of foreign influence. Yes, it sounds Hawaiian but it also has a bit of an Italian flare too. So enjoy. I don’t care how joyful the music sounds it is lazy and disrespectful of the creators that the music doesn’t correspond to the culture being photographed. Apple, attention to detail should be in the DNA. Don’t let your ad agency bring you down! The fact that so many of us found this website is a testimony to the creativity of this commercial and those who conceived it. I find it distasteful of my fellow Greeks to complain that the commercial isn’t Greek enough. Such ethnocentric/egocentric conceit! Where would the world be if cultures, ideas and influences hadn’t mixed – yes in music of course, but in every other aspect as well. Lest we think that such mixing is “modern,” this song was recorded in the 1930s. (By the way, in the 1930s, the bouzouki that some commentators are longing to hear in that commercial was barely born. Look up its history – it is a 20th century instrument that itself borrows from Asia Minor as well as European influences.) I love this commercial, and the music makes me smile. Maybe not classic greek music, but greek nonetheless. It is a happy song. It fits the commercial. If you hate the music, then fine, go away. I respect and admire the music of Kostas Bezos and surely he would have brought us more music if it wasn’t for WWII. War has taken so much art from the world. This slice of history was so great to discover and Apple should do more to bring more historical art back to life. Opa!!! No way the iPhone 7 plus takes those pictures. Looks like a high end DSLR. iPhone never claim that these pictures were taken in an iPhone so technically they are not lying. My wife’s got the iPhone 7 plus so I know the quality of its pictures. The as gives the impression you just point and shoot and they come out brilliantly which is a lie. I agree something is off with these photos, my iPhone 7 does not take pictures like this. In fact, my iPhone 7 takes pretty subpar pictures, I personally think the iPhone 7 Plus photos that my camera takes anyway are worse than what was being taken on the iPhone 5 and iPhone 6. The iPhone 7 pictures look like they go through some sort of filter that strips out color and paints them with watercolor, very low detail. I’m so glad I found all these wonderful comments. I love the ad, the song, the people, the scenery. The incongruity of the yodeling was driving me crazy, and I thank everyone who wrote an explanation. I accept ALL of them as true! Amazing so many people wondered about the music in the iPhone portrait ad. I love the ad because I enjoy Greek scenery but was confused by the music which sounds ungreek even though it is sung in Greek. Thanks to all the commenters who shared their expertise and set the record straight. I will now enjoy the ad even more. BTW, my Samsung Galaxy Note 5 camera can also take “portrait mode” photos. It is a two step process with quite creditable results. It’s thanks to the iPhone ad that I thought to find out if my Android phone’s camera could take photos with varied depth of fields. It does, and I will be using the feature from now on. Can anyone tell me what the name of the instrument is the man with blue and beige sweater is holding? Where can I buy this instrument ? Best commercial by far 2017! How much money did Apple give to the Masai tribe in Tanzania for their new commercial anyone ?